Monkey bread is a classic part of brunch in my family. My mum always made traditional monkey bread. While it always looked and tasted fabulous, it was definitely a mess. When I started to host brunches I wanted to keep the tradition of monkey bread alive, but without the mess. Thus, individual servings were created. 1. Preheat oven to 325 degrees. Spray 6 cups in a muffin/cupcake tin. 2. Open your can of crescent dough, and cut each triangle into 3 equal-sized pieces. Roll each piece of dough into equal size balls. You should get 24 balls per crescent roll can. 3. 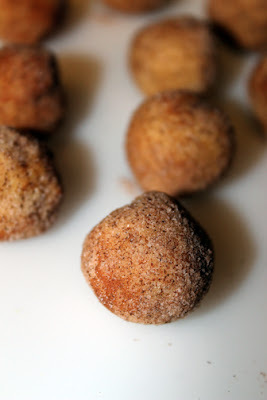 Toss the dough balls in the cinnamon and sugar mixture; until coated. 4. Add syrup and cinnamon to melted butter mixing until combined. 5. Place four balls into each indiviual muffin compartment, pour the butter mixture over each, until the dough balls are slightly covered. 6. Bake for 20-30 minutes, or until dough is cooked and the top becomes caramelized. 7. Remove from the oven, and allow to cool for 5 minutes. Use a knife around the edge of each monkey bread to loosen. Serve warm. Interesting! I quarter biscuits to make my monkey bread. Either way, you can't go wrong ha! Great idea for cutting down on the messiness! This looks amazing and I really want to make it!! BUT I live in the UK and after a bit of research I still don't know what crescent rolls are.. some people online say they are like a croissant? can you give a brief description so I can try to find some over here please, because I NEED to taste these!! These look so yummy! Monkey bread is one of my favorites! Fun! 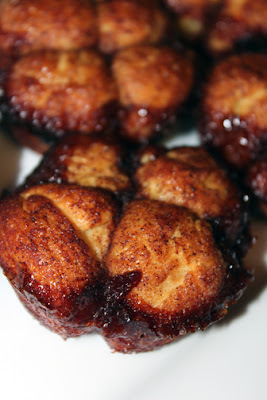 My son loves Monkey Bread.....I will have to try this for him. I've never had monkey bread but it looks delicious! Yum! I've never seen individual monkey bread before! Oooh, I am definitely going to try this! What a great idea! I saw something similar on the Pillsbury website - they look so cute and good. yum!! and so easy! I love monkey bread so much. These look great! Monkey bread is one of the first things I remember cooking on my own. I love it! I've never heard of Monkey bread before, but it sure looks delicious! OMG! I am drooling at my desk. This looks fantastic...a must try! I think I could eat an entire pan of these. Great recipe. I love monkey bread and this one looks perfect. I am drooling over here. Girrrrrrrrrrrrrrrl stop playin....these look so good! This looks SO good and easy to make! Im going to have to try and make these! i agree with the last comment! I could eat it until i'm sick! skinny monkey bread is a great idea! 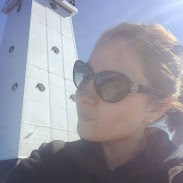 Αωesome blog! Do уou have any hеlрful hints for аspiring ωritеrs? platform like Wordρress or gο foг a pаid option? ӏ'm completely overwhelmed .. Any suggestions? Thanks! world wiԁe web and οn ωeb І found this site as a best webѕіte for most up-tο-ԁate uрdates. Thanks a bunch for sharring this with all of us you really recognize what you're speaking about!